If you've ever suspected the gold market is being manipulated, you're not alone – and you're right, it is. "Central banks and traders (especially the big ones acting on behalf of mega hedge funds, large-scale private funds, and institutions) can push gold prices higher – or lower," Fitz-Gerald wrote. "The financial markets are like a football game in that there is a constant flow of energy between participants. And the 'manipulation' works in both directions, especially when it's being orchestrated by the Fed and other central banks in the name of political expediency." Now it appears China and Russia have had enough of Western central bankers' clandestine gold price manipulation to prop up the U.S. dollar. F. William Engdahl, an American-German economic researcher and best-selling geopolitical author, was recently quoted on the subject by business blog Sputnik on Aug. 16. He said that while key Western banks are artificially restraining gold prices to breathe life into the diluted and devalued dollar system, Russia, China, and other emerging economies are involved in "the genial move" to establish an entirely different gold market. "The COMEX gold futures market in New York and the Over-the-Counter (OTC) trades cleared through the London Bullion Market Association do set prices which are followed most widely in the world. They are also markets dominated by a handful of huge players, the six London Bullion Market Association gold clearing banks – the corrupt JPMorgan Chase bank; the scandal-ridden UBS bank of Zurich; The Bank of Nova Scotia – ScotiaMocatta, the world's oldest bullion bank which began as banker to the British East India Company, the group that ran the China Opium Wars; the scandal-ridden Deutsche Bank; the scandal-ridden Barclays Bank of London; HSBC of London, the house bank of the Mexican drug cartels; and the scandal and fraud-ridden Societe Generale of Paris," Engdahl narrated. 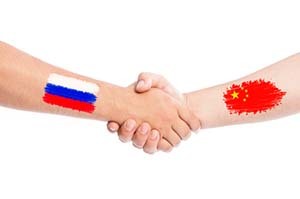 Engdahl noted China and Russia perceive speculative futures contracts (based in London and New York) as lying in the same manipulative hands. He concluded the countries are of a mind to resolve Western gold price manipulation by controlling their own, separate gold market. However, "[r]ather than scream and cry 'fraud' at the owners of the COMEX/CME or the London Bullion Market Association Big Six clearing banks, these countries are involved in the genial move to create an entirely different gold market, one that not JPMorgan Chase or HSBC or Deutsche Bank control, but one that China, Russia, and others of a like mind control," Engdahl stressed. China's new "Silk Road" economic development plan and $16 billion gold investment fund launched in May are all part of the plan to increase China's gold holdings at the expense of the U.S. dollar, Engdahl cites. "As China has expressed it, the aim is to enable the Eurasian countries along the Silk Road to increase the gold backing of their currencies. That sounds very much like some clear-thinking and far-sighted governments are thinking of creating a stable group of gold backed currencies that would facilitate orderly trade free from Washington currency wars. South Africa, also a member of the BRICS along with China and Russia, stands to add to the new energy surrounding a renaissance in gold as a support of solid, well-based currencies to replace the diluted and devalued dollar system," the researcher stressed. It is safe,wise and timely that every individual citizen and country understands the value of Gold. Currency bills in any form ,paper,card ,electronic or bitcoin have limited scope vis a vis credibility. The governments are free to print bills and flush the market.People how soever patriotic may or may not trust the value. USA and China floated unpredictable amount of their currency. So The Gold has come back. Yes. It is a good thing because it is obvious that the fiat money printers do not want GOLD and SILVER to rise and reflect the horrible printing and many TRILLIONS of debts out there. 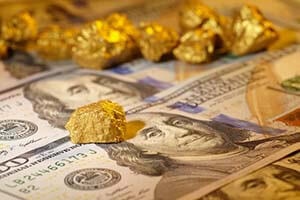 Gold and Silver deserve a platform that is not influenced and controlled by Western Central Banks and their behavior. Nic; Could not agree more with your statement! No use worrying about things one has no control over, in any case I don't hold stock & bonds, gold, silver or other precious or non-precious metals. T world will carry on with or without me, rich or poor.